The number one thing I get complimented on most is my skin! So, what exactly is my secret you may ask? Besides drinking plenty of water, eating a healthy plant based diet, getting enough sleep and staying active, pretty much all of my skin care products are organic, cruelty-free, vegan products!! Being in front of the camera all the time, it’s important for me to feel confident, so I always make sure that I use the best products on the market! 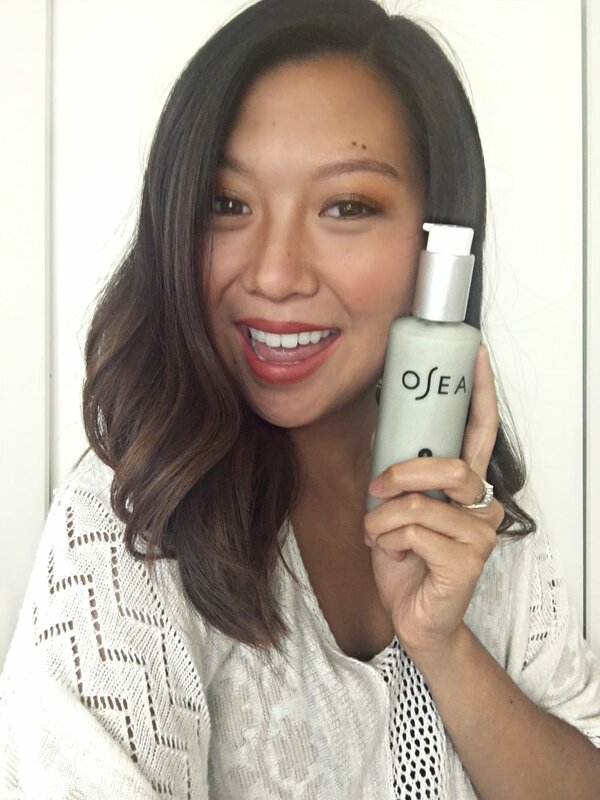 One of my favorite products that I use is "Osea" and you're about to find out why! "OH - SEE - YAH"
Osea is a female-founded family-run business based out of Malibu, CA with the intention of creating a natural skincare line free of toxic, synthetic ingredients. All their products are vegan, cruelty-free, gluten-free and non-GMO. Their sustainably-sourced, organic seaweed trio is USDA certified organic and is sourced from the pristine waters of Patagonia, which acts as the potent base for a majority of their products. 1) Wash face with “Ocean cleanser” and rinse with cold water. 2) Dry face off, then use the “Advanced Protection Cream” on face and neck. 3) Roll the “Undaria Argan Oil” on eyebrows, eyelashes and under eyes. 1) Rinse face with cold water. 2) Spray face with “Sea Vitamin Boost” after putting on makeup or just spray on face if it’s a no makeup day. A refreshing, multi-tasking mineral gel cleanser for normal and dry skin types. Effectively removes dirt, excess oil, and impurities from the surface of your skin while maintaining a hydrated, healthy looking complexion. Star ingredients: Vegan Lactic Acid (derived from beets) promotes a clean, toned appearance; Lime, Cypress, Juniper, Orange, and Jasmine awaken your senses; USDA Certified Organic Red Algae leaves skin looking visibly refreshed, energized, and radiant. May also be used to painlessly remove makeup. Nourishing, hydrating, antioxidant mist. This refreshing spray delivers an immediate feeling of hydration and instant fresh glow to dry, sun-damaged skin. The Pomegranate Extract and Gigartina Seaweed Extract gives this hydrating mist its rosy hue. Visibly reduces the appearance of signs of aging associated with dry skin and dry climates. May be used after applying makeup to set your foundation. Age-Defying Brightening Mask for Dry, Sensitive skin. This multi-tasking age-defying mask balances the appearance of uneven skin tone and soothes redness. Formulated for an immediate, brighter, more luminous complexion. Use twice a week to visibly brighten skin and reduce the appearance of fine lines and wrinkles. Apply mask overnight for an added brightening boost. Rich, age-defying moisturizer for dry, sensitive, and mature skin types (can be used as a night cream for non-blemish prone skin). DPHP, an amino acid compound found in many anti-cellulite creams, helps diminish the appearance of hyperpigmentation and visibly reduces the appearance of fine and lines and wrinkles. Avocado and Macadamia oils are rich sources of essential fatty acids that promote deep hydration. Age defying oil blend for dry, sensitive skin. Restores the appearance of youthful glow and luster diminished by the effects of the sun and aging. Argan Oil infused with Organic Undaria Algae helps minimize visible signs of aging and redness and irritation on the skin’s surface for a more plump looking, more youthful appearance. & free samples with every order.